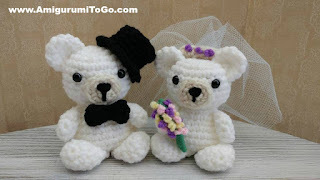 The bear is 4.5 inches from bum to top of ears. 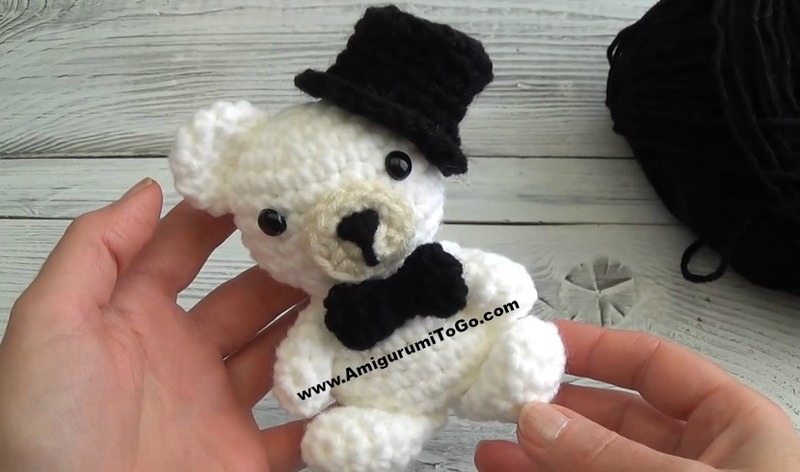 The perfect size for hanging off presents or sitting on top of cakes.The bear pattern is on a different page, here. It is free and also has a video tutorial. Scroll down this page for the written pattern of the Top Hat, bow tie, bouquet of flowers, and veil. small amount of green worsted weight yarn. 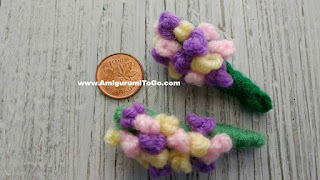 small amount of different colors of yarn to make the small flowers. I used purple, pink and baby yellow. 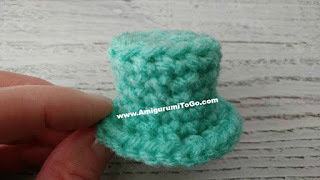 sl st next st and f/o weave in yarn tail *if you want to sew the hat to the head then f/o leaving a long tail for sewing. This hat fits perfectly over the ear with no need for sewing. Position the sewn edges in the center then wrap the yarn tail around the center very tight, knot off and weave in yarn tail. Push a bobby pin though a bit of yarn in the back of the bow tie then push the pin into the body. f/o leaving a long tail. Weave in starting yarn tail. 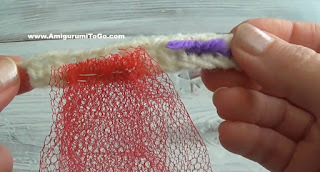 Add in about 5 or 6 French knots with the first color. Fill in the spaces with the 2 other colors. 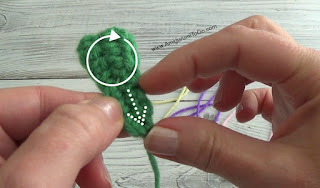 Lay the yarn tails in both directions, that will take away some of the bulk, trim so they are no longer than the green base. 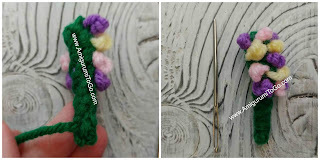 Add flowers to the area in the circle, leave the bottom free, this part will be the stem. Fold the edges of the green together, use the finishing green yarn tail and sew the edges together. Bring the yarn tail through the middle and out at the bottom of the stem, just a little bit away from the bottom as pictured below. 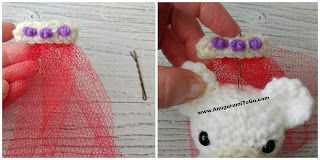 Wrap the yarn tail very tightly around the stem then knot off once you get the stem wrapped up to the bottom row of the French knots. Hide yarn tail inside. Fold in half, make a French knot in the center of the half then 1 French knot on either side. Knot off yarn tails and cut then up short. Bunch up the top part onto half the width of the top piece. Sew to hold that bunched up part. Sew the crinoline to one side of the top piece then fold over the top piece so that the crinoline is now sandwiched between the halves. Trim the top of the crinoline then sew the top edge of the top piece together, sew the ends together, then sew through the bottom of the top piece. Knot off when done and weave in yarn tail. 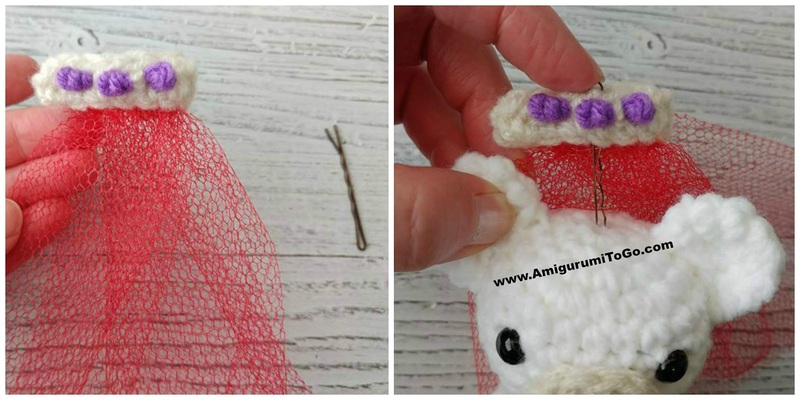 Push the bobby pin through the top of the crocheted piece of the veil and use it to attach the veil to the head. And you're done! I hope you enjoyed the pattern. the link is in the introduction, the 2nd sentence under the first photo at the top.